The Moscow Kremlin ( Russian : Моско́вский Кремль , tr. Moskovskiy Kreml , IPA: [mɐˈskofskʲɪj krʲemlʲ] ), usually referred to as the Kremlin , is a fortified complex at the heart of Moscow , overlooking the Moskva River to the south, Saint Basil's Cathedral and Red Square to the east, and the Alexander Garden to the west. It is the best known of the kremlins ( Russian citadels ) and includes five palaces, four cathedrals, and the enclosing Kremlin Wall with Kremlin towers . Also within this complex is the Grand Kremlin Palace . The complex serves as the official residence of the President of the Russian Federation . The name " Kremlin " means "fortress inside a city",  and is often also used metonymically to refer to the government of the Russian Federation in a similar sense to how " White House " is used to refer to the Executive Office of the President of the United States . It had previously been used to refer to the government of the Soviet Union (1922–1991) and its highest members (such as general secretaries, premiers, presidents, ministers, and commissars). The term " Kremlinology " refers to the study of Soviet and Russian politics. The site has been continuously inhabited by Finno-Ugric peoples since the 2nd century BC. The Slavs occupied the south-western portion of Borovitsky Hill as early as the 11th century, as evidenced by a metropolitan seal from the 1090s which was unearthed by Soviet archaeologists in the area. Vyatichi built a fortified structure (or "grad") on the hill where the Neglinnaya River flowed into the Moskva River . Dmitri Donskoi replaced the oak walls with a strong citadel of white limestone in 1366–1368 on the basic foundations of the current walls;  this fortification withstood a siege by Khan Tokhtamysh . 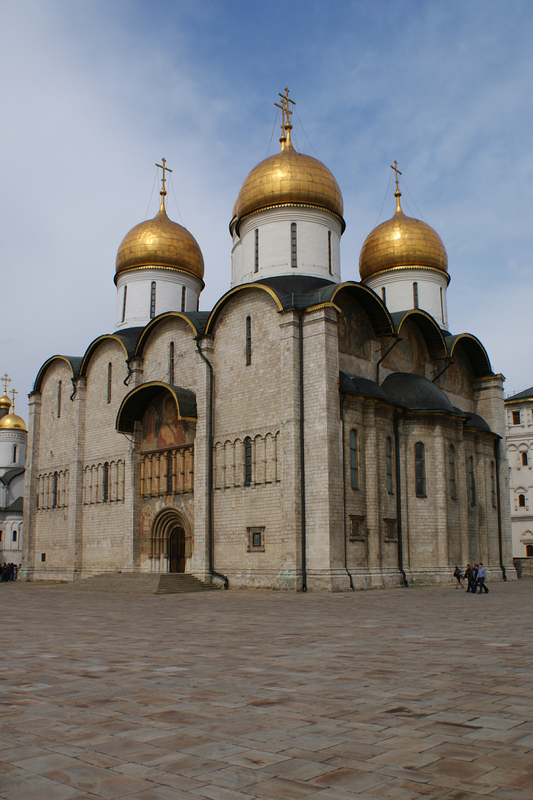 Dmitri's son Vasily I resumed construction of churches and cloisters in the Kremlin. 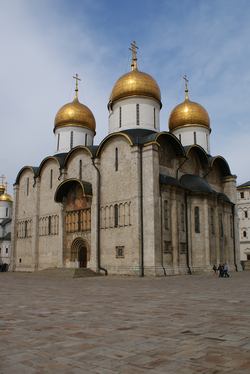 The newly built Cathedral of the Annunciation was painted by Theophanes the Greek , Andrei Rublev , and Prokhor in 1406. The Chudov Monastery was founded by Dmitri's tutor, Metropolitan Alexis ; while his widow, Eudoxia , established the Ascension Convent in 1397. Grand Prince Ivan III organised the reconstruction of the Kremlin, inviting a number of skilled architects from Renaissance Italy , including Petrus Antonius Solarius , who designed the new Kremlin wall and its towers, and Marcus Ruffus who designed the new palace for the prince. It was during his reign that three extant cathedrals of the Kremlin, the Deposition Church, and the Palace of Facets were constructed. The highest building of the city and Muscovite Russia was the Ivan the Great Bell Tower , built in 1505–08 and augmented to its present height in 1600. The Kremlin walls as they now appear were built between 1485 and 1495. Spasskie gates of the wall still bear a dedication in Latin praising Petrus Antonius Solarius for the design. After construction of the new kremlin walls and churches was complete, the monarch decreed that no structures should be built in the immediate vicinity of the citadel. The Kremlin was separated from the walled merchant town ( Kitay-gorod ) by a 30-meter-wide moat, over which Saint Basil's Cathedral was constructed during the reign of Ivan the Terrible . The same tsar also renovated some of his grandfather's palaces, added a new palace and cathedral for his sons, and endowed the Trinity metochion inside the Kremlin. The metochion was administrated by the Trinity Monastery and boasted the graceful tower church of St. Sergius , which was described by foreigners as one of the finest in the country. During the Time of Troubles , the Kremlin was held by the Polish forces for two years, between 21 September 1610 and 26 October 1612. The Kremlin's liberation by the volunteer army of prince Dmitry Pozharsky and Kuzma Minin paved the way for the election of Mikhail Romanov as the new tsar. During his reign and that of his son Alexis and grandson Fyodor , the eleven-domed Upper Saviour Cathedral, Armorial Gate , Terem Palace , Amusement Palace and the palace of Patriarch Nikon were built. Following the death of Alexis's son, Fyodor, the Kremlin witnessed the Moscow Uprising of 1682 , from which czar Peter barely escaped. As a result, he disliked the Kremlin. Three decades later, Peter abandoned the residence of his forefathers for his new capital, Saint Petersburg . 1883 photo of the Grand Kremlin Palace , now the official residence of the President of Russia . Although still used for coronation ceremonies, the Kremlin was abandoned and neglected until 1773, when Catherine the Great engaged Vasili Bazhenov to build her new residence there. Bazhenov produced a bombastic Neoclassical design on a heroic scale, which involved the demolition of several churches and palaces, as well as a portion of the Kremlin wall. After the preparations were over, construction halted due to lack of funds. Several years later, the architect Matvey Kazakov supervised the reconstruction of the dismantled sections of the wall and of some structures of the Chudov Monastery, and constructed the spacious and luxurious offices of the Senate , since adapted for use as the principal workplace of the President of Russia. Following the French invasion of Russia in 1812, the French forces occupied the Kremlin from 2 September to 11 October. When Napoleon retreated from Moscow, he ordered the whole Kremlin to be blown up. The Kremlin Arsenal , several portions of the Kremlin Wall and several wall towers were destroyed by explosions and fires damaged the Faceted Chamber and churches. Explosions continued for three days, from 21 to 23 October. However, the rain damaged the fuses , and the damage was less severe than intended. Restoration works were held in 1816–19, supervised by Osip Bove . During the remainder of Alexander I 's reign, several ancient structures were renovated in a fanciful neo-Gothic style, but many others were condemned as "disused" or "dilapidated" (including all the buildings of the Trinity metochion) and simply torn down. On visiting Moscow for his coronation festivities, Nicholas I was not satisfied with the Grand, or Winter, Palace, which had been erected to Rastrelli 's design in the 1750s. The elaborate Baroque structure was demolished, as was the nearby church of St. John the Precursor, built by Aloisio the New in 1508 in place of the first church constructed in Moscow. The architect Konstantin Thon was commissioned to replace them with the Grand Kremlin Palace , which was to rival the Winter Palace in St. Petersburg in its dimensions and the opulence of its interiors. The palace was constructed in 1839–49, followed by the new building of the Kremlin Armoury in 1851. After 1851, the Kremlin changed little until the Russian Revolution of 1917 ; the only new features added during this period were the Monument to Alexander II and a stone cross marking the spot where Grand Duke Sergei Alexandrovich of Russia was assassinated by Ivan Kalyayev in 1905. These monuments were destroyed by the Bolsheviks in 1918. The Soviet government moved from Petrograd to Moscow on 12 March 1918. Vladimir Lenin selected the Kremlin Senate as his residence. Joseph Stalin also had his personal rooms in the Kremlin. He was eager to remove all the "relics of the tsarist regime" from his headquarters. Golden eagles on the towers were replaced by shining Kremlin stars , while the wall near Lenin's Mausoleum was turned into the Kremlin Wall Necropolis . The Chudov Monastery and Ascension Convent , with their 16th-century cathedrals , were dismantled to make room for the military school. The Little Nicholas Palace and the old Saviour Cathedral were pulled down as well. The residence of the Soviet government was closed to tourists until 1955. It was not until the Khrushchev Thaw that the Kremlin was reopened to foreign visitors. The Kremlin Museums were established in 1961 and the complex was among the first Soviet patrimonies inscribed on the World Heritage List in 1990. Although the current director of the Kremlin Museums, Elena Gagarina ( Yuri Gagarin 's daughter) advocates a full-scale restoration of the destroyed cloisters, recent developments have been confined to expensive restoration of the original interiors of the Grand Kremlin Palace, which were altered during Stalin's rule. The existing Kremlin walls and towers were built by Italian masters over the years 1485 to 1495. The irregular triangle of the Kremlin wall encloses an area of 275,000 square meters (68 acres). Its overall length is 2,235 metres (2,444 yards), but the height ranges from 5 to 19 meters, depending on the terrain. The wall's thickness is between 3.5 and 6.5 meters. Originally there were eighteen Kremlin towers , but their number increased to twenty in the 17th century. All but three of the towers are square in plan. The highest tower is the Troitskaya, which was built up to its present height of 80 meters in 1495. Most towers were originally crowned with wooden tents; the extant brick tents with strips of colored tiles go back to the 1680s. There are two domestic churches of the Metropolitans and Patriarchs of Moscow, the Church of the Twelve Apostles (1653–56) and the exquisite one-domed Church of the Deposition of the Virgin's Robe , built by Pskov artisans over the years 1484–88 and featuring superb icons and frescoes from 1627 and 1644. The other notable structure is the Ivan the Great Bell Tower on the north-east corner of the square, which is said to mark the exact centre of Moscow and resemble a burning candle. Completed in 1600, it is 81 metres (266 feet) high. Until the Russian Revolution, it was the tallest structure in the city, as construction of buildings taller than that was forbidden. Its 21 bells would sound the alarm if any enemy was approaching. The upper part of the structure was destroyed by the French during the Napoleonic Invasion and has, of course, been rebuilt. 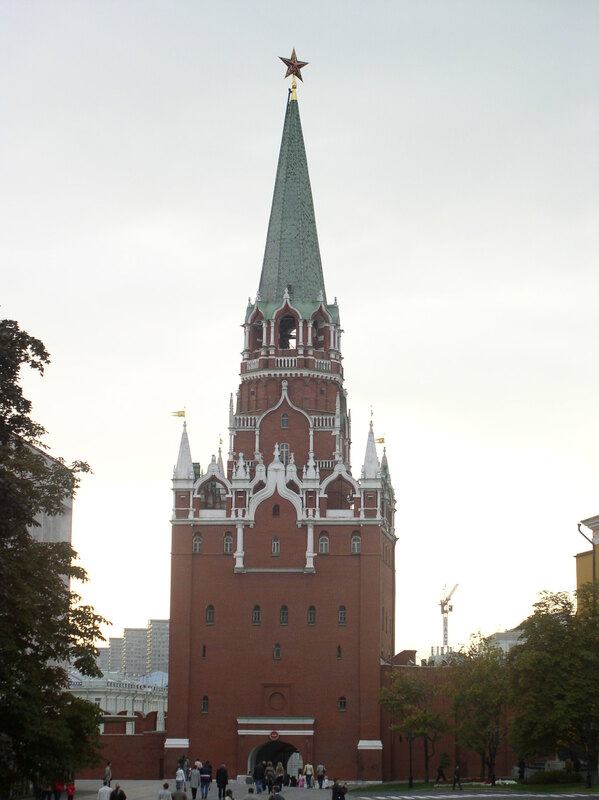 The Tsar bell , the largest bell in the world, stands on a pedestal next to the tower. The oldest secular structure still standing is Ivan III 's Palace of Facets (1491), which holds the imperial thrones. The next oldest is the first home of the royal family, the Terem Palace . The original Terem Palace was also commissioned by Ivan III, but most of the existing palace was built in the 17th century. 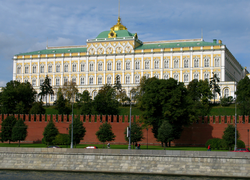 The Terem Palace and the Palace of Facets are linked by the Grand Kremlin Palace . This was commissioned by Nicholas I in 1838. The largest structure in the Kremlin, it cost an exorbitant sum of eleven million rubles to build and more than one billion dollars to renovate in the 1990s. It contains dazzling reception halls, a ceremonial red staircase, private apartments of the tsars, and the lower storey of the Resurrection of Lazarus church (1393), which is the oldest extant structure in the Kremlin and the whole of Moscow. The northern corner of the Kremlin is occupied by the Arsenal , which was originally built for Peter the Great in 1701. The southwestern section of the Kremlin holds the Armoury building . Built in 1851 to a Renaissance Revival design, it is currently a museum housing Russian state regalia and Diamond fund. The nearest Moscow Metro stations to the Kremlin are: Okhotny Ryad and Biblioteka Imeni Lenina ( Sokolnicheskaya Line ), Teatralnaya ( Zamoskvoretskaya Line ), Ploshchad Revolyutsii ( Arbatsko-Pokrovskaya Line ), Arbatskaya ( Arbatsko-Pokrovskaya Line ), Alexandrovsky Sad ( Filyovskaya Line ) and Borovitskaya ( Serpukhovsko-Timiryazevskaya Line ). All information for Moscow Kremlin's wiki comes from the below links. Any source is valid, including Twitter, Facebook, Instagram, and LinkedIn. Pictures, videos, biodata, and files relating to Moscow Kremlin are also acceptable encyclopedic sources. Cynthia Marsh. "Kremlin". Words of the World. Brady Haran (University of Nottingham). "Почему кремлевские стены красили в белый цвет"
"Fly me to the Kremlin: Putin to commute to work by chopper"
"Vladimir Putin gets Kremlin helipad to ease congestion"
Other wiki pages related to Moscow Kremlin.